But education can close the gap. TORONTO — A global education study reveals larger-than-average earning gaps between Canadian men and women, but that narrows as women pursue higher levels of study. The report from the Organization for Economic Co-operation and Development analysed data from 35 member countries and 11 partner countries. 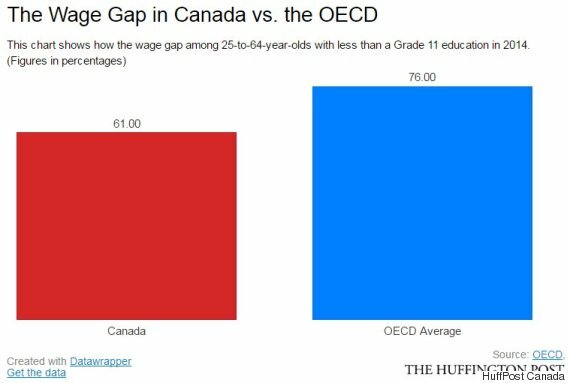 Among 25- to 64-year-olds with less than a Grade 11 education, Canadian women earned 61 per cent of what men earned in 2014, compared with the 76 per cent average across OECD countries. 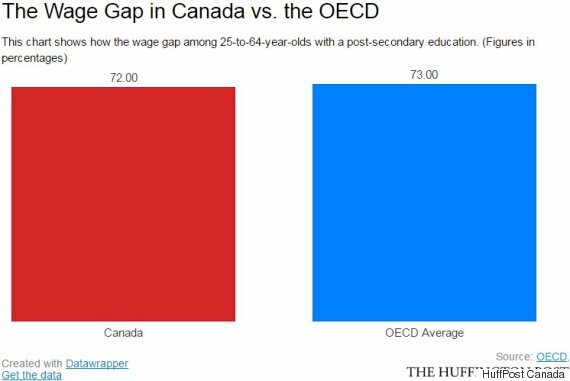 Canadian women who achieved post-secondary studies fared a bit better at 72 per cent of what men earned, which is comparable to the OECD average of 73 per cent. In other data, Canada had the largest share of adults with post-secondary education but a lower-than-average share of masters and doctoral degrees in 2015. Last year, 55 per cent of Canadian adults had post-secondary education, the highest share among OECD countries compared to an average of 35 per cent. Canada also spends more per post-secondary student than almost all of the OECD countries, at US$21,500. That places Canada sixth overall, after Luxembourg, Sweden, Switzerland, the United Kingdom and the United States.